Last semester, the Whitworth physics department began offering a course that specializes in designing and constructing robots. The course, EN/CS 396: Special Topic: Robotics, teaches students advantageous electronic and engineering skills, as well as how to overcome obstacles and adapt to the use of new technology. 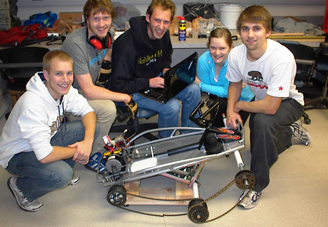 For the past decade, a robotics project was part of the third-year electronics course and was well-received by students. Richard Stevens, a Whitworth professor of physics and the current instructor of EN/CS 396, says he and his colleagues recognized a need to incorporate robotics further into their classes. The course is an extensive learning experience covering all stages of robotic development. At the end of the class, a competition is held among the students’ robots. The robots must complete three tasks: climb a set of stairs to locate and extinguish a small fire; locate a crying baby doll and gently rescue it; and navigate a slalom, a timed race involving several different checkpoints, course while removing obstacles in its path. In addition to teaching the skills listed above, the course targets improving students’ critical thinking and problem-solving skills. Junior Alden Welsch says the class gives him a taste of what it is like to work on a project in the context of engineering. Welsch says the class requires students to work within a budget and within the requirements of the robot’s tasks while still giving them the freedom to design the robot however they wish. EN/CS 396 Special Topic: Robotics was first offered in fall 2012, and will continue this coming spring semester. Nine students took this course in fall, and they will be joined by one or two more in the spring. The class is currently a one-time course, but the physics department hopes to offer it again in the future. Stevens, who joined the Whitworth faculty in 1995, and his areas of specializes in physics and chemistry. He is involved in the research of laser spectroscopy as a tool for examining the physical world.